The below process is used to create projects from Project Service Automation application (PSA) to Microsoft Dynamics 365 for Finance and Operations. Integrate a customer from Project Service Automation application (PSA) to Microsoft Dynamics 365 for Finance and Operations and verify that the customer records are successfully integrated. 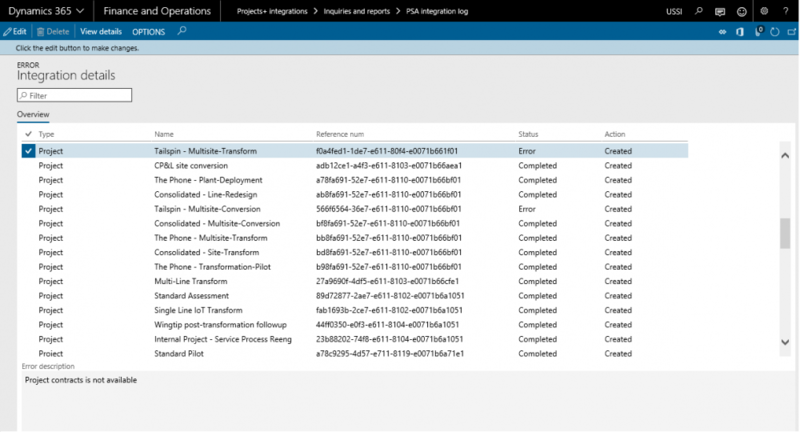 Integrate a project contract from Project Service Automation application (PSA) to Microsoft Dynamics for 365 finance and Operations and verify that the records are successfully integrated. Create a Project in Project Service Automation application (PSA) to be integarated in to Microsoft Dynamics for Finance and Operations. Details: This button is used to view the Project Service Automation application (PSA) integration line details. Project Name Defaults from Project Service Automation application (PSA). Start and End Date Defaults from Project Service Automation application (PSA). GUID Project Service Automation application (PSA) projects unique GUID?